We all want to look stylish. But what if we like a certain piece of clothing so much but it just doesn’t look good? Given we picked the right color, the answer could be that it doesn’t suit your body shape! 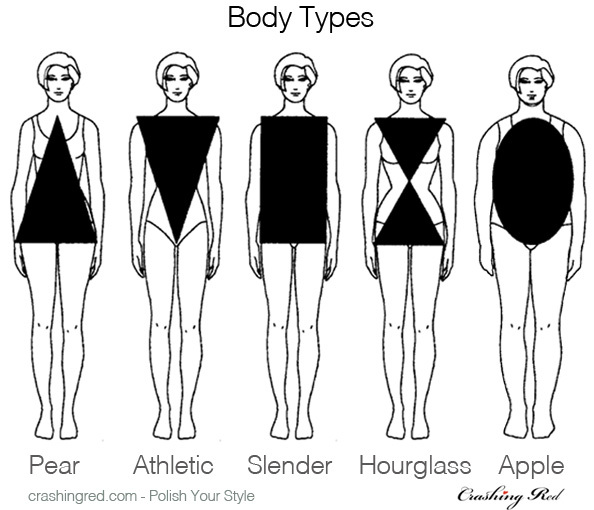 Here is a quick run down of the most common body shapes and how to determine which body type you are. This will help you choose the most flattering cuts for your shape! The hip measurement will be the largest, with narrow shoulders and defined waist. Pear shapes can be mistaken for being hourglass. The difference is that you most likely have a slim upper body as opposed to an hourglass which has both bottom and upper body voluptuousness. Examples: Jennifer Lopez, Jennifer Love Hewitt, Rihanna. Best wear: Anything fitted on your upper body and a belted waist followed by a flared or A-line skirt is the best choice for you. Opt for darker colours to slim your bottom half and lighter coloured tops to draw attention to your upper body. Add chunky statement accessories. Athletic body types are top heavy with broad shoulders, well defined arms and a toned belly. Think gymnast. You’re toned, without much curve and your hips are square. Best wear: Same as for the Slender body type, you can wear almost anything. You’ll rock anything sport chic, skinny jeans and short shorts like no one else. If you wish to accentuate your feminine features choose A-line dresses and skirts that will show off your body. Highlight your waist with belts. Lean, light build body, small joints, long limbs, a flat chest, small shoulders and not curvy. Your hip measurements will be almost the same as your chest and your waist will be slightly less. Examples: Jada Pinkett Smith, Milla Jovovich, Keira Knightley. Best wear: Most clothes will fit you perfectly and seriously, you can wear whatever you want! To avoid looking too androgynous highlight your femininity with frills, fluted edges and ruffles to create more volume and feminine curves. Long statement necklaces that fall around the bust area would be also great. Shoulder and hips are the same measurement while the waist measurement is considerably smaller (25% less). Examples: Beyonce, Jessica Simpson, Halle Berry. Best wear: A Hourglass body shape is the best looking in a bikini! As for clothes, you should be accentuating your waistline and choose well fitted styles. You can wear any shape skirt but the pencil skirt is the most flattering on you. Stay away from tank tops as they will give volume to your arms. Also avoid large square dresses. Hip and shoulder measurements will be almost the same and the waist will be very similar or larger than the hip/shoulder measurement. Examples: Jennifer Hudson, Kelly Osbourne, Britney Spears. Best wear: Usually Apple shapes have great legs. So your best choice would be anything that shows off your legs and lose around your waist. Loose short dresses paired with high heels, skinny jeans paired with a loose blouse, printed pants. Avoid lose jeans. That’s the basics. We’ll be going into this subject in much more detail in our upcoming “Polish Your Style” book! ps. 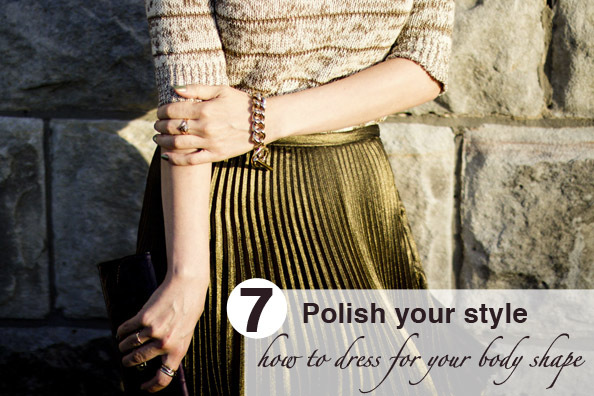 More posts from the “Polish Your Style” series can be found here. Thanks for sharing, great post! Always handy to know which body parts to focus on when dressing! It is crucial to know your own body shape if you want to develop a great style. Unfortunately, almost no one knows it so that this post is great. Apropos polish your style: Will you sell your “Polish your style” book worldwide? Hopefully I’ll start getting more athletic soon too :) babies, what do they do to us! ?